The inaugural President’s Award Scheme took place on Thursday 27 September at the Royal Hotel, Cookstown. 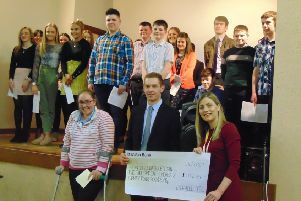 The scheme, which aims to encourage members to get involved in additional activities and events offered by YFCU, rewards those who participate in traditional competitions and those who have participated in a wide range of programmes. These programmes are as diverse as mental health, farm safety, rural crime, and those who hold club, county and central office positions. Over 80 members met the eligibility criteria in their respective age categories and were awarded certificates. The top three members in each age category were invited to the awards ceremony to receive their certificates and plaques. James Speers, YFCU president, commented: “It was an honour to host the first President’s Awards Scheme, and celebrate the commitment of our members. “It is encouraging to see so many meet the eligibility criteria for this new scheme, and they deserve this recognition.